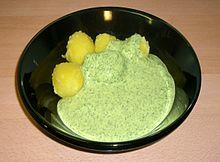 There are many traditional types of Hessian Green Sauce which are popular all over Germany, but especially around Frankfurt am Main and Kassel, which lay claim to its origins. The Frankfurt-style is made from hard-boiled eggs, oil, vinegar, salt, and generous amount of seven fresh herbs, namely borage, sorrel, garden cress, chervil, chives, parsley, and salad burnet. Variants, often due to seasonal availability, include dill, shallots, lovage, lemon balm, and even spinach. In more frugal times, daisy leaves, broad plantain leaves, and dandelion leaves were also used. You can buy all the herbs for this sauce in this section of our website. The sauce is served cold with peeled boiled potatoes as an accompaniment to either hard-boiled eggs or roasted beef brisket. It may also be served with cooked fish or roast beef, or as a side dish to barbecue. A local schnitzel specialty, called Frankfurter Schnitzel, is always served with green sauce, along with apple cider (Apfelwein) as a traditional accompanying drink. Green sauce was supposedly Goethe's favourite condiment; a legend that his mother invented it is likely apocryphal. The local importance of the famous dish is shown by the abundance of green sauce at local markets and by the Green Sauce Monument installed in Frankfurt-Oberrad in 2007. The latter consists of seven small greenhouses with the main herbal ingredients and was part of the Luminale, a local art and light event. We can supply a collection of the herbs needed for this sauce,some as plants and some as seeds for a cost-saving £9.50; or if you already grow some of them you can find the others listed separately in this section.